Observe how the amount and angle of sunlight cast on our planet changes during the year, causing day and night, and the different seasons. 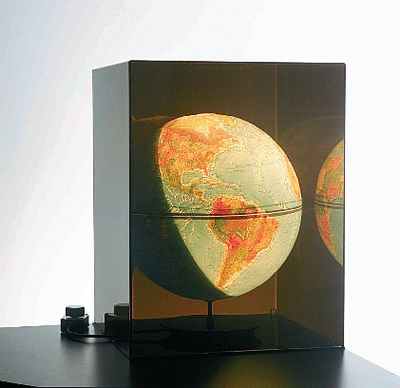 The handcrafted globe is contained in a plexiglass cover that re-creates the blackness of space. Lit from within, the globe is shielded so that only half the planet is visible as it turns, showing how the sun illuminates half the Earth at a time. The shield gradually rotates over a six minute period to simulate the changing pattern of sunlight falling over each hemisphere during the year. A bright spot represents the position on the Earth where the sun is directly overhead. The multi-setting control allows you to observe the globe with lit rotation, unlit rotation, or no rotation. Some assembly required. 110 VAC; Globe size: 16" dia. ; plexiglass cover size: 18"L x 18"W x 23"H.